Size of Male: 45-75 lbs., 24-26 in. Size of Female: 45-75 lbs., Greater than 22 in. Its rough wiry coat may not qualify as eye candy, but the German Wirehaired Pointer is your ideal do-it-all dog. Its amphibious hunting skills and novel webbed feet cannot be ignored. The breed is one tough cookie and makes an excellent companion for the energetic pet owner. When you trace its bloodlines, this breed might be considered by some as a mongrel of a dog. In the 1800s, hunters specifically bred the pooch from the early Stichelhaar, Pudelpointer, German Shorthaired Pointer, Polish Water Dog and Griffon. They wanted to produce an offspring that had the capabilities of a spaniel, a retriever and a pointer. Though the dogs were immensely popular in Germany, they were not recognized as an official breed until the 1920s. This was also the time when the first wave reached American soil. German Wirehaired Pointers are jealous and protective types. They will often act dominantly around smaller animals, treat strangers suspiciously and bark with gusto to warn you of anything amiss. Although they are active and affectionate, they do not tolerate rough handling. Most of them get noisy and destructive when isolated. This is not the best breed for individuals with little time for their pets. Living Environment – A hunter by heart, the breed fares best when given a chance to explore and exercise in a field or yard. These dogs desire to be with the master of the house, making them more suited to staying indoors than outdoors. Rain or shine, hot or cold – any environment can be weathered by this adaptable pooch. Grooming – This dog breed sheds moderately to heavily, so expect some work both with vacuuming and brushing. Coat care is necessary after a few days’ intervals. Use a stiff bristled brush for optimal results. Proper dog show grooming calls for having this dog breed’s hair stripped, not clipped. Apart from its wiry coat, be sure to give those doggie ears a regular check-up and cleaning. Most allergies and infections begin in the ears. Diet & Exercise – Some enthusiasts recommend a 100 percent raw diet, but if you’d rather serve something cooked for your pet, prepare your own or select a high-quality commercial meal that uses the following base ingredients: poultry, fish or mutton. During heavy shedding periods, you may have to increase the protein content a bit. Exercise is a daily ritual. At the minimum, your dog will require an hour of vigorous physical exertion. A combination of running, biking, tracking and field exercises is recommended. In good weather, take the pooch out for an enjoyable swim. Health – Despite their spirited behavior, some dogs may be afflicted with chronic heart problems. The breed is also prone to inherit hip arthritis and elbow dysplasia. Hip and elbow exams are strongly suggested. Don’t be let down by this dog breed’s stubborn streak. When you are patient and firm with them, they can be quite eager pleasers. 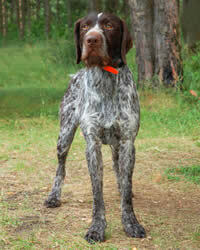 The well trained German Wirehaired Pointer is very good in scaling obstacle courses and in tracking exercises.